People who were there reported that several Liberal Democrat speakers spoke in favour of the motion. The Conservative members didn't say anything. Eventually a Conservative Councillor (Vicky Weston) said a few words and moved a procedural motion to proceed to next business - which meant that the meeting moved onto the next item without a vote on the actual motion. Martin Tod (Liberal Democrats) called for a recorded vote (so that there would be a written record of how everyone voted). 23 Conservatives voted in favour of proceeding to next business, 22 Liberal Democrats against. So the debate was over without a vote on the motion, which in essence resulted in a blocked motion. There is plenty that could be said here regarding the way this motion was handled by the Winchester Conservatives, but let's concentrate on just one item: we've heard that the Conservative councillor before her procedural motion mentioned that the council is being involved in "local matters", representing "local hard working people". This is a very shortsighted way to see their roles and actually damaging the debate as it divides the local electorate into people who are worth working for and those who are apparently not. For a start it is not clear what is meant by 'local' people (e.g. are you still 'local' without a British passport?) and secondly, are people who are for whatever reasons not 'hard working' not allowed to have representation? And of course, do we really have to spell it out that these 'local hard working people' (in the widest sense) are the same people who are already affected negatively by what is currently going on? Also, and this shouldn't even have to be mentioned, people who are on the remain side are 'local hard working people' too, and their side of the argument should still be fairly heard and debated properly - especially as the nation is so divided! 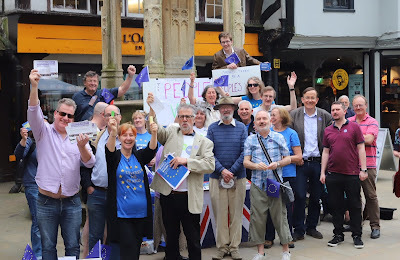 It was actually mentioned in the motion debate that some Winchester district residents are planning on leaving the country (or have already left) because of problems with their status resulting out of the changes required by the UK leaving the European Union. These people are taking action as they are tired of being made into second class citizens by the Conservative government, losing democratic rights that they had, in the Brexit process. 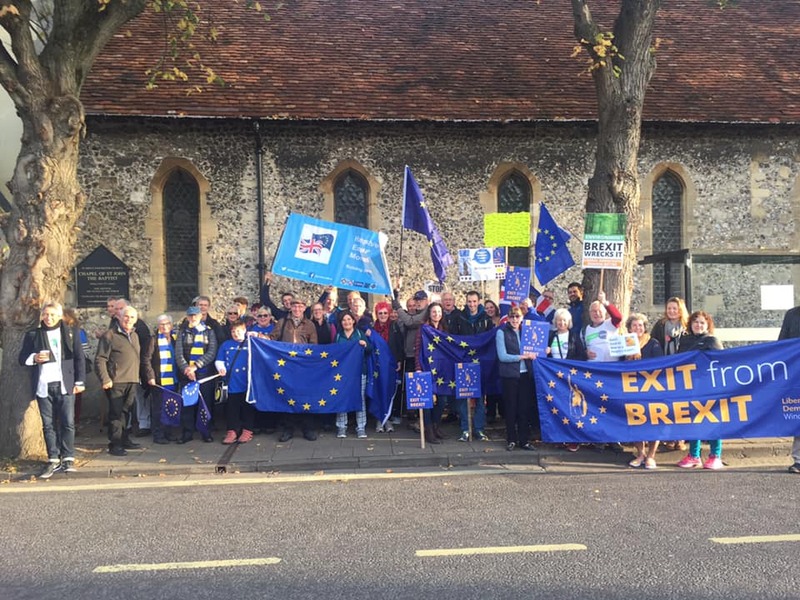 Apart from leaving gaps in the social fabric of Winchester, these people contributed with their taxes to the UK's exchequer (EU migrant workers contribute £2,300 more per year to UK than average British citizen, study reveals). Losing them is a very real effect on the UK and local people! If you are not happy with the motion result, please keep writing to your local councillors and MP! 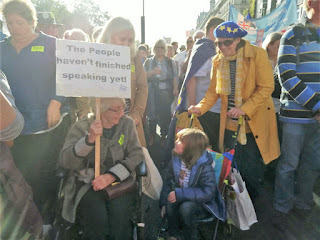 People's Vote March For The Future - what a march it was! Yesterday saw one of the biggest ever protest march in the history of the UK, second only to the anti-war protests in February 2003. 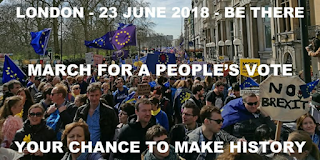 Following beforehand on Facebook how many people from all parts of the UK said they would come along this time, I expected this march to be big, and the organisers put a number of 100,000 participants out there. The actual number was heart warming: most media reported about 700,000 participants! 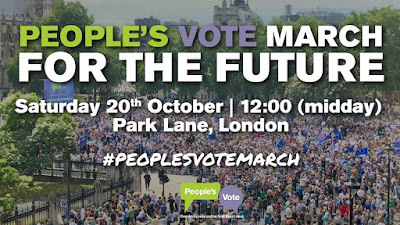 And of course The People's Vote UK has a lot of tweets about the march on Twitter. Another big group of committed campaigners, possibly even more, travelled by train. A big well done and thank you to everyone who invested their time and energy on making this protest so outstanding! What do we do now? 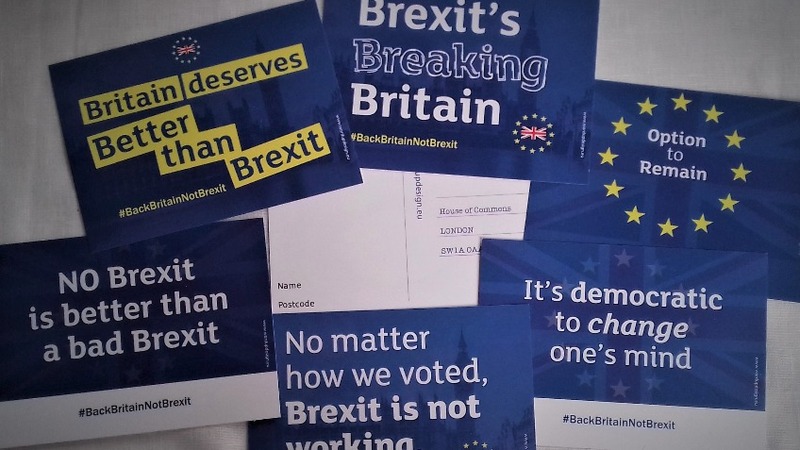 The Leave side is busy rallying people to write to their MPs ("£250,000 ad campaign urges voters to oppose May’s Brexit plan"). It is very important to write to your MP too to represent the other side! It doesn't have to be a long email or letter, but the more they get, the better. Letter writing is an important tool to have your voice registered with your representatives. See the Have Your Say! tab with suggestions on how to go about this. Please do write to your MP! 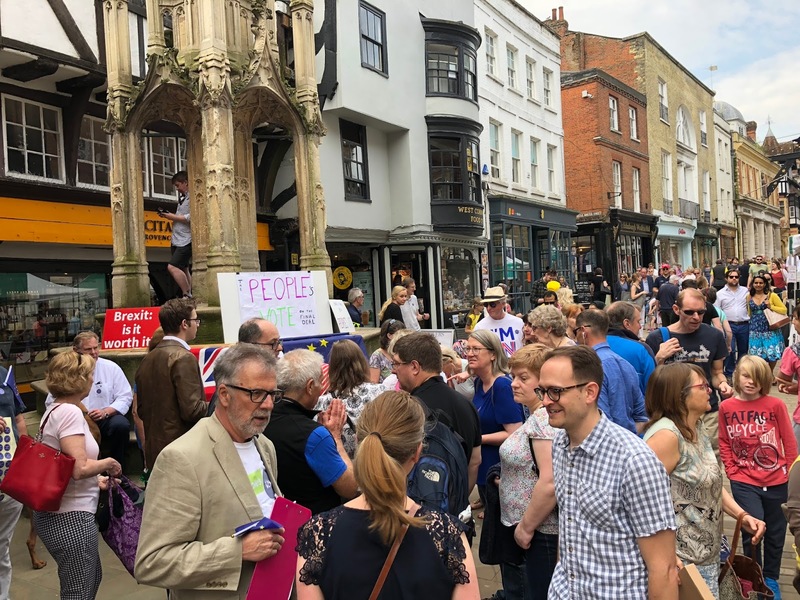 Since our last blog post in June, things have been moving fast: there were two more street stalls in Winchester - and it is only one more week until the big People's Vote March For The Future in London! This march is hugely important! If you can, drop everything and attend! We need to show how many are opposing what the UK government is trying to do! It's easy to get to the march from Winchester in good company on the COACH organised by the European Movement Hampshire. Have you booked your ticket yet? If not, do so now, there are not many seats left! If you should prefer to go by train but don't want to travel on your own, we would recommend to ask for travel companions in the Facebook group of The 48% - Winchester. 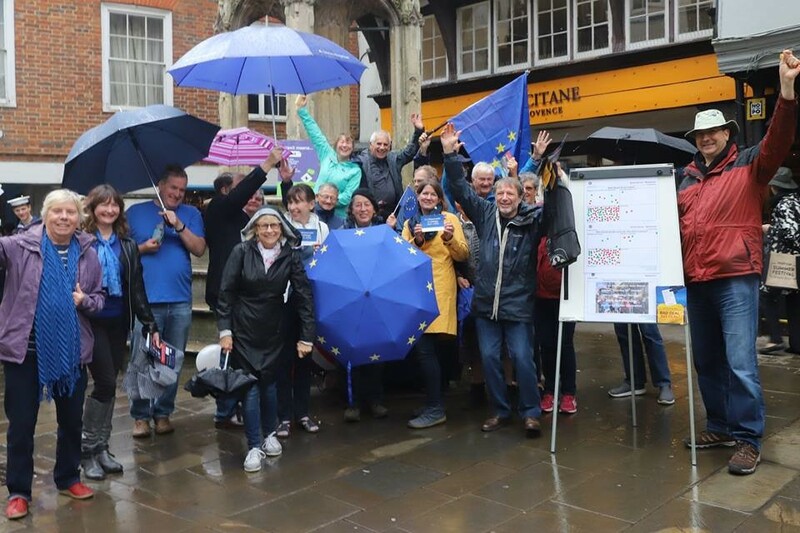 "EU supporters gathered on Saturday 22nd September for Action Day, marked by all the leading organisations opposed to Brexit. 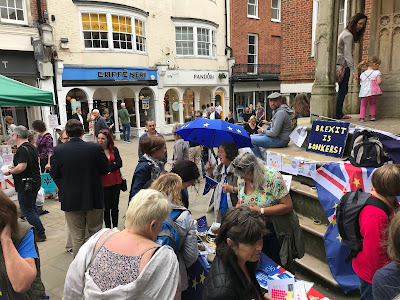 In Winchester the Hampshire European Movement, the 48% Winchester and the Win-IN (Winchester International Network) set up a stall by the Buttercross to show passers-by in the High Street the folly of Brexit. 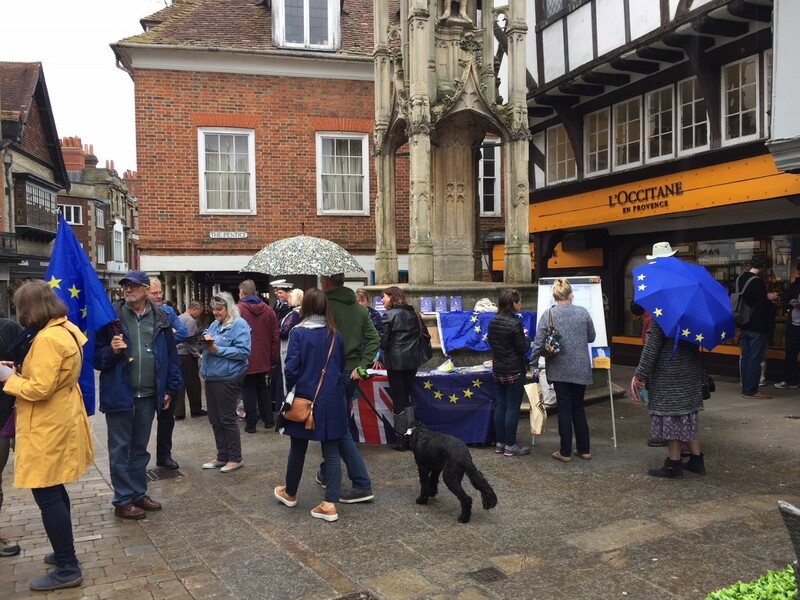 Winchester voted 59% to remain in the EU, and the prospect of Brexit is already having negative effects on many. Holidays are more expensive, prices are rising quicker than wages, the NHS and others have staffing problems. 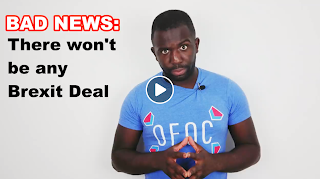 FEELING THE BREXIT SQUEEZE? was the right question on our brochure — and the right question for the High Street. More than 60 volunteers, wearing something blue and waving EU flags, attended the European Movement stand and the 48% Winchester gathering. Many members of the public signed the EM petition asking the Government to Release the Brexit Impact Studies. And in a spirit of democracy there were also some heated discussions with a few Brexiteers, where all “agreed to disagree”. The lovely sunny afternoon added to the occasion — as did the presence of the Winchester Morris Men, giving extra sound and motion effects to the discussions on politics and Brexit. Perhaps inspired by the Morris Men’s hankering for tradition, a group of Remainers then adjourned to the pub!" 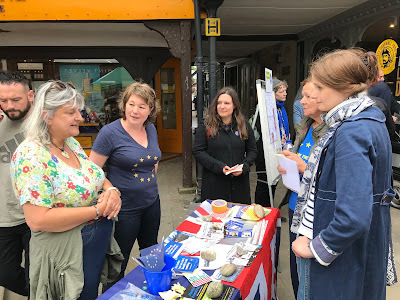 One campaigner wrote this about the day: "My favourite quote from the day was a lovely lady who said 'it's all a bit of a muddle really' thus summing up the whole Brexit debacle in one sentence. People were divided on the question about who should have a say on final decision with someone saying 'it was the people who got us into this mess in the first place' and someone else saying she feared giving a peoples vote risked dividing an already divided nation even further. Lots of people are very unhappy with the way things are going." 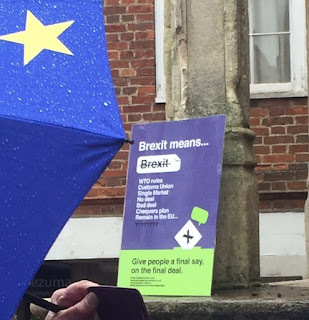 Another one had this to add: "the Brexitometer was busy throughout the morning, in spite of the rain. At times we had a queue for it. I met a young man who had been working in the EU import/export business who had just been made redundant because of Brexit. He was very interested in our campaign and signed up to join the group." The next stall was on 6 October. 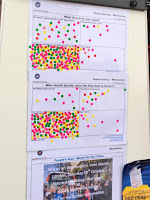 One of our campaigners described the day as follows: "Unfortunately for this event the weather was foul. 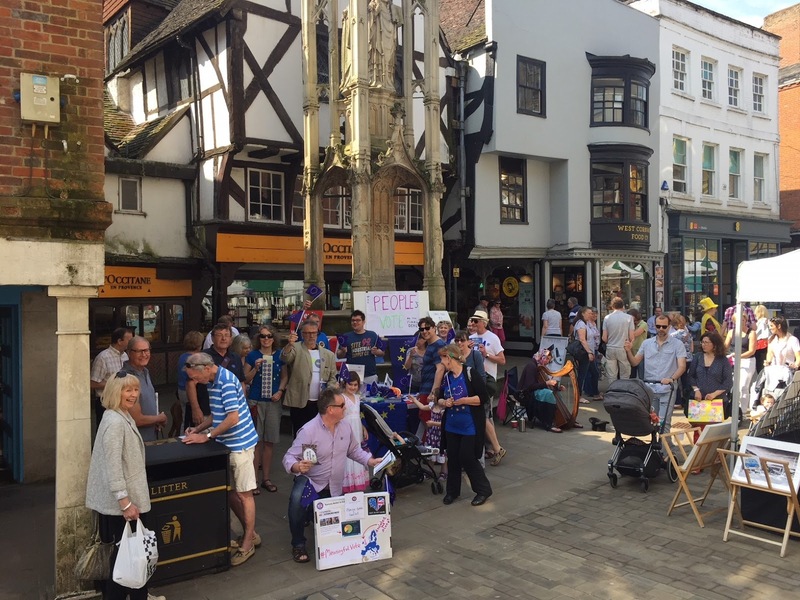 The purpose of the stall was to promote the march on 20 October. What struck me was (1) the number of well-wishes from outside Hampshire (e.g. Shropshire, Northern Ireland). Plus a lady came from Andover just to wish us well. And (2) the number of people who were already committed to going in the march." Once again, a big thank you to all the people who helped with the stalls! 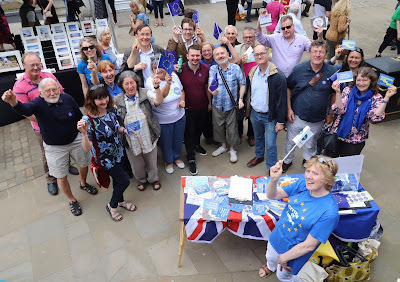 If you should be interested to help with the next activity and are not yet connected to us through Facebook or Twitter, please sign up to our mailing list to keep in the loop. Is Brexit going well? 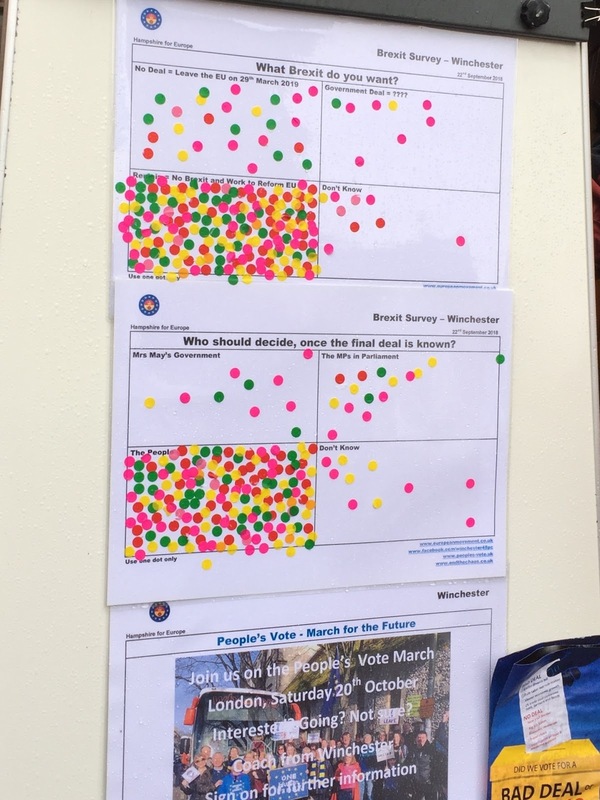 The Brexitometer speaks for itself! 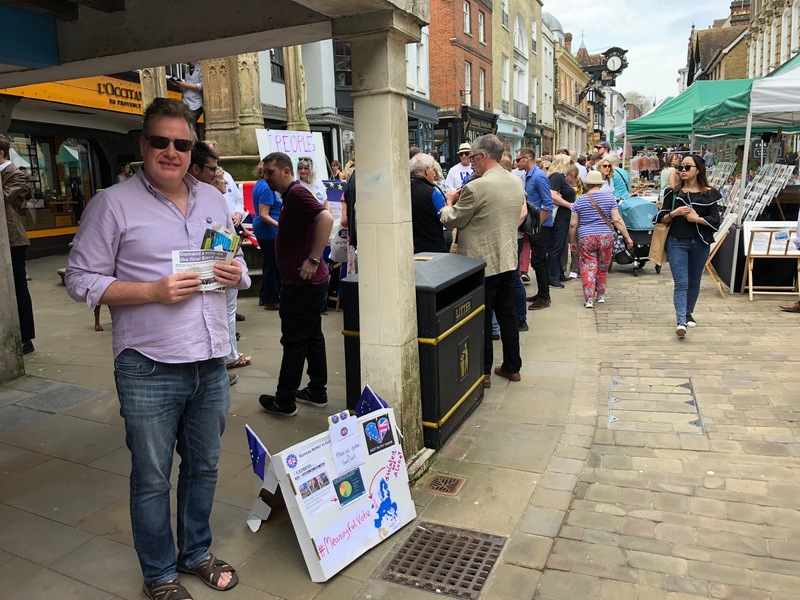 On Saturday there was another Pro-EU street stall in Winchester, this time to gauge the mood in regards to 'how Brexit is going' and also to promote the People's Vote march on 23 June in London. If you are joining us in London on 23 June for the march, why not book a coach ticket to travel with a group? Some tickets are still available! See here for details. On top of that we had a reporter and a camera man from the BBC there, interviewing one of our activists at the stall, and they were also later talking to another campaigner, a local non-British EU citizen who is leaving the UK after 12 years because of the status changes that are coming for her when the UK leaves the EU. 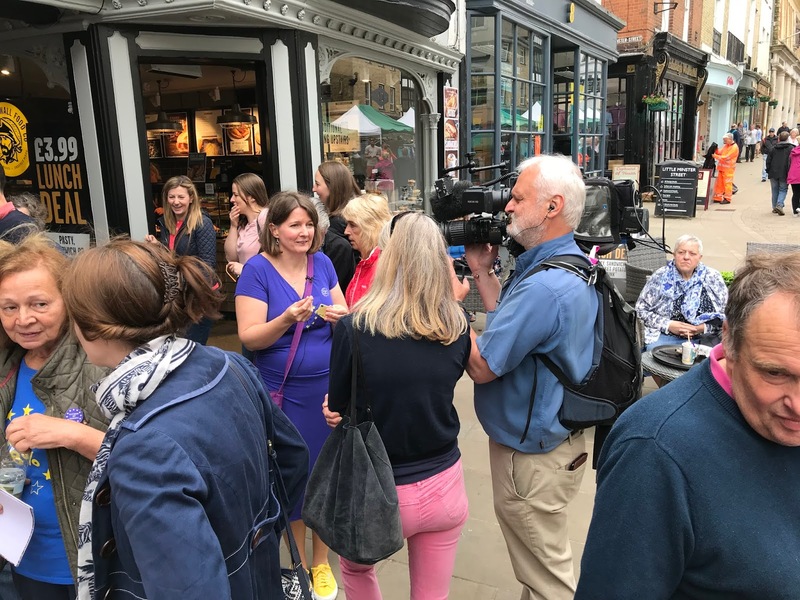 Some of the footage should be on BBC South News on the days running up to the march in London (we don't have an exact date/time yet), so keep an eye out for us! The stall was supported by activists from The 48% -Winchester, the European Movement, the local Liberal Democrats, and of course Win-IN. We had an excellent turnout of campaigners (either representing these groups or just themselves), despite this stall only being advertised not even a week beforehand. Thank you to all of you - and a special thank you to Richard Murphy for his outstanding photos! If you should be interested to help with the next one and are not yet connected to us through Facebook or Twitter, please sign up to our mailing list to keep in the loop. GDPR - and what happened to our mailing list! 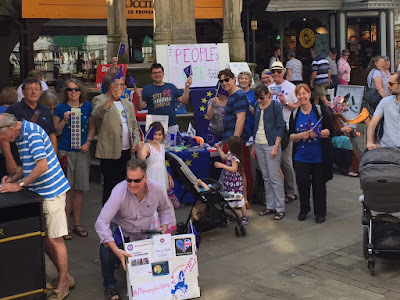 Our list isn't huge, on Thursday 24 May we had 175 email addresses with names in there, collected at various events and also through this website. Once I got my head around all the changes necessary, it transpired that I had to set up a new sign-up form on the MailChimp site (the link is on the Contact tab) and remove the embedded form from our website. On the new form every subscriber has to grant us clear permission to email them. To make things watertight, we had to ask electronic confirmation of this permission for every existing subscriber, so on Thursday I sent out an email to all of them asking to give us this permission to keep emailing them. Here is what happened: so far, out of the 175 subscribers a few have unsubscribed and only about 30 opted in, 17%. Ouch - but I think this will be similar for most of the organisations who asked for opt-in. According to MailChimp's report, we had an email opening rate of 38.7% (which is slightly better than what we normally get and definitely better than the non-profit industry standard at 18.8%), in real numbers that was just under 70 people looking at the mail - and less than half of those have opted in. I fear the emails to the rest of our subscriber list have either disappeared in spam folders or been ignored. But it’s OK, I want our emails to go to interested people. If you happen to be one of our subscribers and haven't seen an email but would like to keep in the loop, please do check your spam folder and if you find the mail please do what the email asks of you. If you are not able to find the email, then please re-subscribe via our sign-up form on the MailChimp site. It really only takes a moment. Alternatively if you still have one of our previous mails, locate the Update Your Preferences link at the bottom and follow the instructions given there. In addition to that, if you think our emails are useful, you could always point friends who might be interested to our website or the email campaign archive and ask them to subscribe too. Alternative ways to stay in touch are of course to use RSS (for the website), or social media. 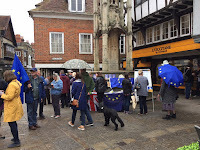 This morning at the Winchester Buttercross we had a nice big group of friendly pro-EU campaigners (from Winchester and further afield) coming together, representing various groups like the European Movement, The 48% - Winchester, and, of course, Win-IN. 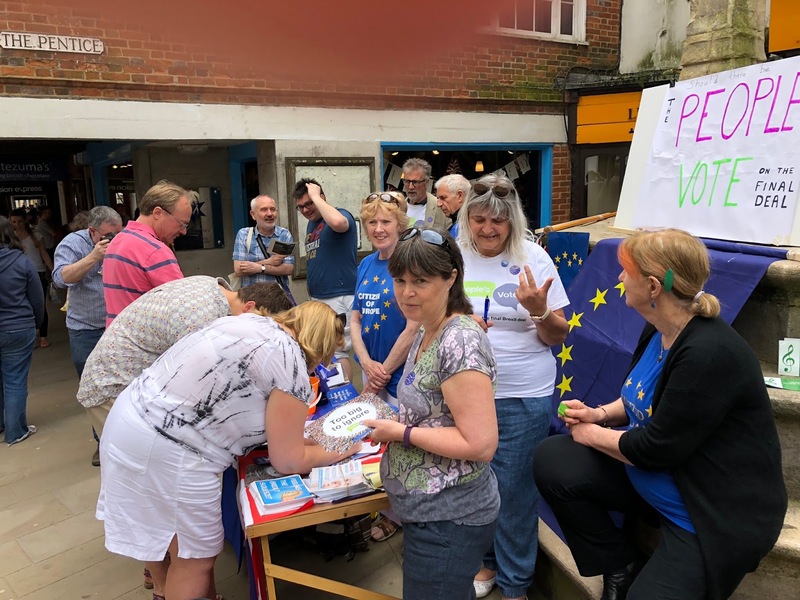 Once again many people on the High Street were happily engaging with us. Our small EU flags, badges and Citizen of Europe stickers were well received and many stories were shared about how Brexit will adversely affect (and in many cases already affects) people's lives, be they from the UK or from other EU countries. 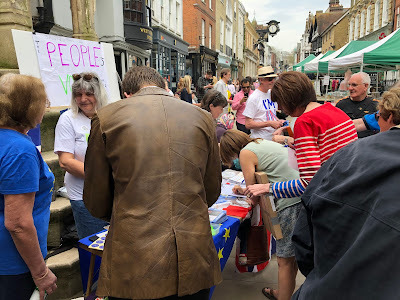 We invited everybody to cast a vote on whether there should be a People's Vote on the Brexit deal, and also to write postcards to our local MP. Votes and postcards were gathered in a transparent ballot box and will be taken to our MP in due course. 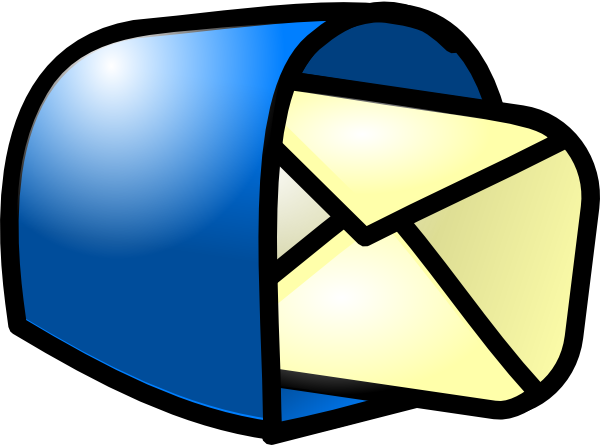 If you would like to be kept in the loop about future events please sign up to our mailing list on the Contact tab.